If you've ever looked at the instruction manual that came with your CPAP mask you may have noticed a chart called the "pressure flow curve". 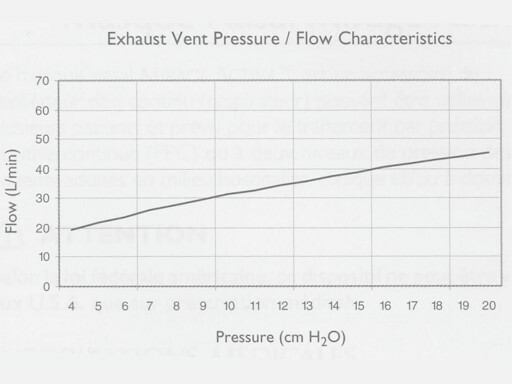 The pressure flow curve indicates the designed rate of flow through the mask's built-in vents. It's a pretty interesting graph, especially if you're using software to analyze your CPAP data. In this article we'll look at some examples of the pressure flow curve for a couple of different CPAP masks, both nasal and full face, and you'll learn why this graph may help you achieve better therapy. Here's the pressure flow curve for the Philips Respironics Amara Full Face Mask. Amara full face mask pressure flow curve. On the left side of the graph, we've got the leak rate in SLPM, or standard liters per minute. Often you'll see this unit of measurement as L/min or LPM or SPLM. The S in SPLM means the measurements have been taken at standard temperature (likely 68 degrees Fahrenheit) and standard pressure (likely 1 atmosphere). Across the bottom of the graph we've got pressure in the units of centimeters of water, or cm H2O, which is the standard unit of measurement for CPAP machines in the United States and elsewhere. Reading the graph couldn't be easier. Just find your pressure setting along the bottom of the graph, and then draw an imaginary line (or a real one because it's your manual, right?) up to the curved line associated with your mask model. At the point where your vertical line meets the curve, draw another imaginary (or real) line horizontally to the left until you hit the left vertical axis of the graph. Where you end up is the leak rate for your mask at your particular pressure setting. Remember, though, that each mask has its own pressure flow curve, so the graph for the Amara mask above may not be indicative of the vent flow in your own mask. In the Amara graph, the leak rate for the Amara is the topmost curve, while the lower curve is for an add-on exhalation vent called the Whisper Swivel II. The Whisper Swivel II can be used on masks without a built-in vent. If your pressure setting is 10, then your leak rate on the Amara mask would be about 45 L/min, while the leak rate would be just under 30 L/min if you were using the Whisper Swivel II with a mask that doesn't have a built-in exhalation vent. Now, you may be wondering where all this "leaking" air goes. I'll show you. Take a look at the vent on the Amara full face mask in the picture below. Amara full face mask vent shown in the right side of the photo, with lots of little tiny holes. 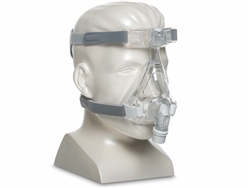 CPAP mask manufacturers make significant efforts to diffuse vented air so that it isn't bothersome to the user or bed partner, and so that it doesn't compromise comfort or therapy. The idea is to diffuse air quietly and direct it away from people. Some vent designs do this better than others. A lot of newer vent designs have lots of holes. Older vents have slits in the mask elbow so that air just flows right down the elbow near the connection with the tube. Really old masks might not have a vent at all, and so a device like the Whisper Swivel II would be required to provide adequate venting. (Notice on the pressure flow curve for the Amara above, the Whisper Swivel II curve is also shown as a comparison). Let's quickly take a look at another pressure flow curve for the ResMed Mirage Activa nasal mask. Note that this graph as well as the one shown above was simply copied right from the instruction manuals that came with the masks. 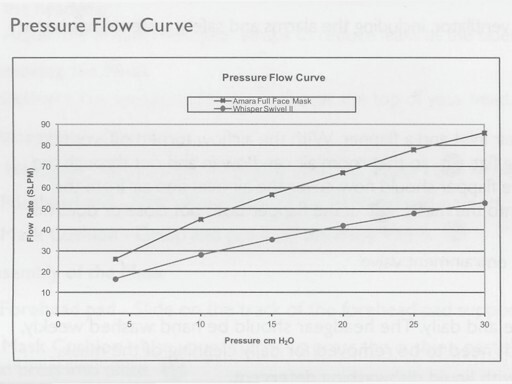 Pressure Flow Curve Showing Designed Leak Rate for the Mirage Activa Nasal Mask. From the Activa pressure flow graph we can see that at a pressure of 10, the leak rate would be just above 30 L/min. So, how can the pressure flow curve for a particular CPAP mask help you achieve better therapy. Great question! Here are a few issues to consider. At higher leak rates the net CPAP pressure delivered through the mask drops. Generally the drop in pressure isn't significant, but at higher pressures with certain masks the drop can mean the difference between effective therapy and a lousy night of sleep. Let's take the Amara full face mask as an example. The Amara mask has a designed leak rate of 50 LPM at a pressure setting of about 12 cm H2O. At 50 LPM the drop in pressure is 0.6 cm H2O. This means that if your CPAP machine is set to 12 you'll probably only be experiencing a pressure of 11.4 on your side of the mask. It's not a huge difference, but it could be enough for you to need to tweak your pressure setting on your machine. If you've recently changed masks and feel the effectiveness of your CPAP therapy has changed, this pressure drop could be one explanation for the change you've experienced. Generally speaking, sound output increases with increased vent leak rate. Of course, there are many different vent designs for all the various CPAP masks available - some vent designs are better than others at diffusing vented air - but it stands to reason that sound output from the mask vent may increase as the designed vent leak rate increases. The mask vent design is an issue you might consider if you've switched to a new mask and notice a difference in noise from the mask. Hopefully any differences you notice in newer masks are the good kind of differences - like a mask making LESS noise. But you may also notice a mask making more noise. If your mask makes more noise than you'd like, consider a mask with a better vent design. One trick that works pretty well and that can be applied universally to all CPAP machines and masks, is to add a filter at the air outlet on the CPAP machine. This won't affect the leak rate in the mask vent, but it can help reduce noise in the tube. If you're using a CPAP machine like the System One REMstar Auto, or the IntelliPAP AutoAdjust and if you've got the software for analyzing your data (or if you've taken us up on our offer of a free report with the purchase of your CPAP machine) then you'll be able to see your leak rate as recorded by the machine. It's useful to know your actual leak rate and the designed leak rate of the mask, so you can determine if you're experiencing leaks due to fit issues during your sleep. Some software shows "large leaks" and the amount of time spent during large leaks. This type of data can help you know if your mask is fitting and sealing well during sleep, and can help you select a more suitable mask if necessary. As always, hit us up with any questions or comments. We look forward to hearing from you!